Jarrod and I have been contemplating schools for Ethan for the past couple of months and have finally made a decision. We are enrolling him at a Montessori in Huntington Beach August 1st. We couldn’t be more excited! Like I’ve mentioned in the past we really like his daycare, but we feel he is ready for more of a ‘school’ environment where he can be challenged and learn to be independent. 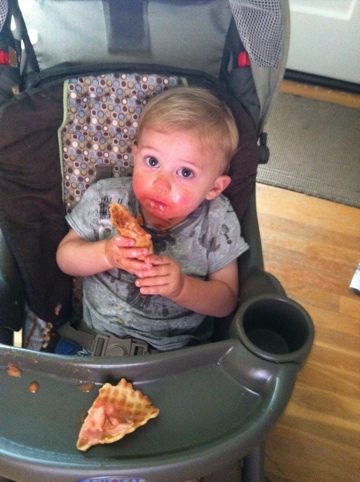 I’ve been used to the daycare feeding him everyday so anyone with lunch ideas for a 1 1/2 year old, I’m all ears. I was out of town for a friend’s bachelorette last weekend on Friday and Saturday night. Jarrod and Ethan got a long just fine without me 🙂 While I was there, Jarrod sent me a video of Ethan going down the slide at the park.. This was sort of a big deal for us as it was the first time he climbed up there by himself and went down with no assistance. Not only did he go down on his bottom, but he went down face first on his tummy and every other way you could think of. I’m telling you, this kid has no fear! Today Ethan has had a really runny nose, sneezes and cough. I’m hoping it’s allergies or teething, but I’m starting to think it might be a cold 😦 We took him to the farmers market and it wasn’t the best trip there we’ve ever had. He pretty much cried the entire time. We took Ethan to the beach yesterday with a picnic. 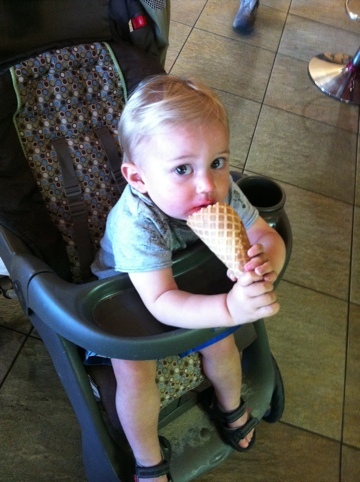 We stopped by Aroma di Roma on the way home and got him his first gelato. He LOVED it!!! It was so cute (and a giant mess) but it was worth it! He went immediately into the bath when he finished. We are looking forward to being in town this weekend (finally!) so hopefully there will be some more beach time. The weekend after we are heading to Fresno and Bass Lake for the 4th of July weekend. Don’t know if I mentioned it but Ethan has 1 more tooth for a total of 8 now. His gums look pretty tender so I’m sure there are more on the way soon. He still weighs about 23 1/2 pounds. We are going to the Dr. on July 8th so I should find out what percentile weight/height he falls into.